OK, let’s see if I can make a habit of blogging, then we’ll see about changing the direction of this blog. To recap 2011: the spring was very busy with the girls’ Lacrosse season. I also traveled quite a bit for work, and we went to Arizona for Spring Break. During the summer I had a fabulous time training for an Olympic distance triathlon with a great group of friends. Then in August, about a week before the race, my back went out. I have not recovered. My scoliosis has finally caught up with me, and I have severe arthritis in my lower back. I spent the fall struggling to make it through a day of work. So grocery shopping and cooking went out the window, much less all the extras such as making homemade yogurt, cottage cheese and bread. Beggars can’t be choosy. The cooking fell to my husband and daughters. Last month I had an epidural steroid injection, and I am doing somewhat better. I’m not content to spend the rest of my life as an invalid, as a burden to my family. Therefore I am launching a last-ditch effort to completely clean up my diet and to start an exercise program to build strength without stressing my body. I decided on a Paleo/Primal approach. I liked the diet and exercise plan from Mark Sisson. His exercise plan is free, and I downloaded The Primal Blueprint 21-Day Total Body Transformation for $9.99 to my iPad. So we’ll see. I always do better on a lower carb diet anyway. Today is my first day, and the book has a daily journal to fill out, so I figured this would be as good a place as any to record my entries. The whole reason I chose this diet is because I get to eat coconut. Hardest part: Doing it at all. Sorry, I couldn’t bring myself to dispose of my baking supplies or the cereal or granola bars the rest of the family eats. Best part: There’s nothing in the pantry that looks tempting to me, so I don’t think it’s an issue. 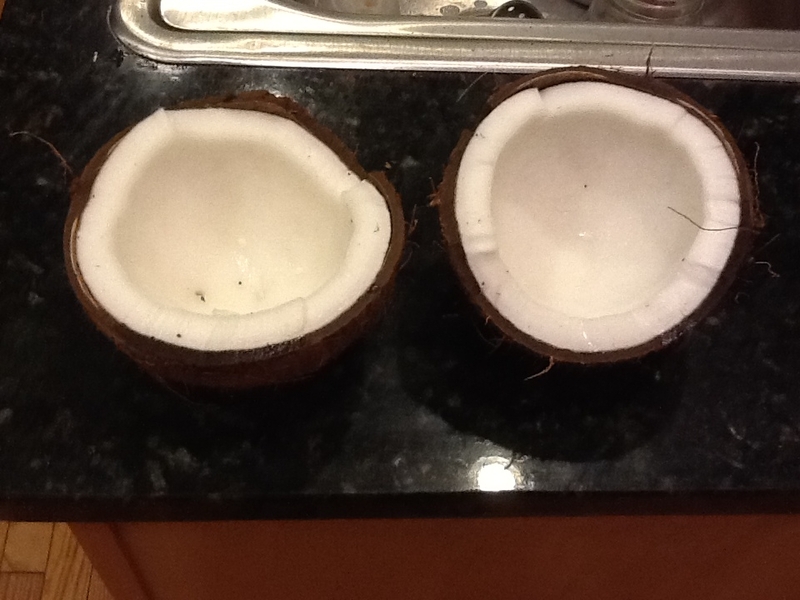 Comments: My husband opened a fresh coconut for us tonight – yum! 1. Walked 4.5 miles with a friend on the greenway. Despite the cold and the wind, we had a great walk! 3. OK, fail on movement. Items acquired today: I did not shop today. Comments: I bought a pull-up bar last month, so I have all the equipment I need for the workouts. I have mixed feeling about the whole barefoot thing, and I don’t see myself wearing Vibram FiveFingers. I did purchase a lot of tasty Primal-approved food at EarthFare on Saturday. Sounds like ur heading in a positive direction. Keep us up dated w the paleo. I’ll b cking it out.. Wish I hard more will power against my number 1 carb. BEER! I hear ya, Monica! I can give up beer for 21 days now that we’re past the holidays, but that is the grain product I’ll miss the most by far! Great walk yesterday! Increasing daily movement: Can you walk stairs at work? Our building is all on one level. I can sometimes take the stairs at the hospital, but usually I am dragging a wheeled bag with my study supplies behind me. What about stairs at home? Do your squats before and after sitting at the computer? Good luck, I know you miss all your intense training.